Regular readers know that I'm participating in Grow It Cook It Can It's Cook It! 2012 monthly technique challenge. 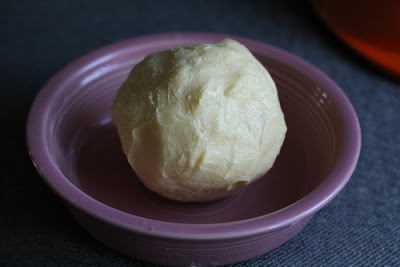 The March challenge was making your own butter. After reading Caroline's post I figured it would be like ... well ... like buttah. Seriously. I brought my Kindle into the kitchen because I thought I'd just dump in the cream, turn on the mixer and read some chapters, just relaxing by the fire, while the butter made itself. It started off as expected, see? I put two pints of cream in at one time. Clearly that was too much liquid to not expect massive splashing. I had no idea that my mixer freakin' goes to eleven. Honestly, I never turn the speed up above about level 3 because that always seemed plenty powerful. But since the instructions for the butter said "high speed," I decided to take a risk. A very messy risk indeed. Anyhoo, all was not lost. I lowered the speed back to level 4 and put a dishcloth blankie over the mixer. And whaddya know? After about six minutes, I had lovely whipped cream. And after about 14 minutes, I had butter and buttermilk. No joke! 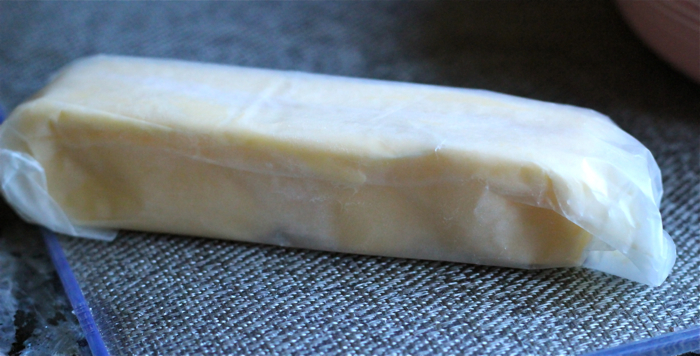 Once you see the big blob of butter, it's done. 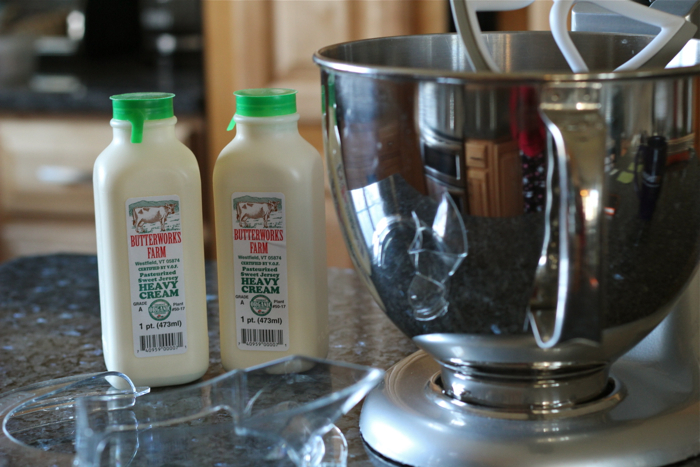 Drain off the buttermilk into a container and stick it in the refrigerator for later use (see the cake recipe below). 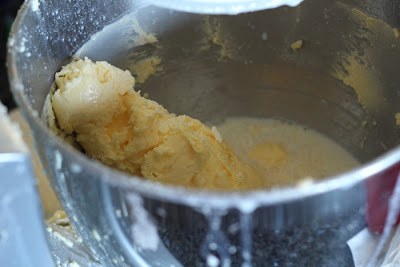 Then scrape out all the butter, mash it into a big ball and run it under cold water, squeezing out as much residual buttermilk as you possibly can (although it's not much). Verdict? 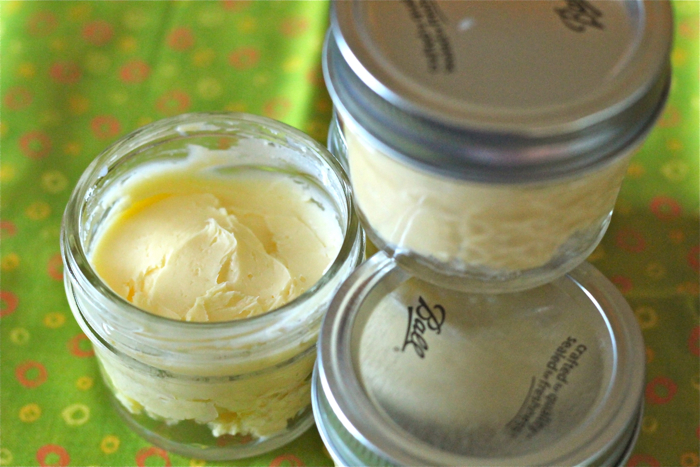 As long as you keep your batches small and your speed under control, making your own butter is easy-peasy. Now ... how to use that lovely butter and buttermilk? How about a pound cake (which is basically an excuse to eats lots of butter without just licking the stick)? Oh yeah. I found this recipe via Pinterest. It's funny, I don't have a lot of recipes that call for buttermilk in my repertoire because I always avoided them so I didn't have to buy buttermilk (I ended up only using a smidge and then tossing the rest when it went bad). Then I discovered the make-your-own technique of adding white vinegar to a cup of milk: genius. But now I had some real buttermilk, made by me (well, sort of -- more like "separated by me", I guess). Plus the perfect Bundt pan that I found ... wait for it ... AT THE DUMP. OK, OK, before you freak out, let me explain. It's not really a dump, not the way I remember them from my youth. It's our local solid waste transfer station, where I can dispose of recyclables, composting scraps and yard waste, not just household trash. And at this station they have a little hut called the "Re-Use Center", for items that are too good to throw away (books, household items, kids stuff, furniture). I always scout it out before I leave, just in case (I've gotten some canning jars and nice books) -- because, let's face it, I think that somewhere deep inside of me lives a cheap hoarder who loves free stuff. 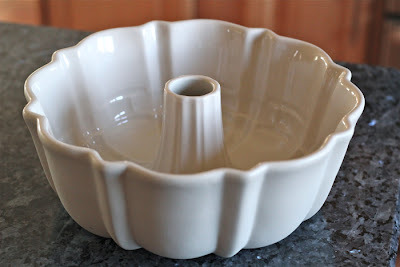 A few weeks ago, I did a walk-through of the Re-Use Center after dropping off my composting scraps and -- lo and behold -- a stoneware Bundt pan. It clearly had never been used -- ever. It was too pristine. So I snatched it up. Yep -- beautiful stoneware for free. Score one for The Ninj. But back to the cake. 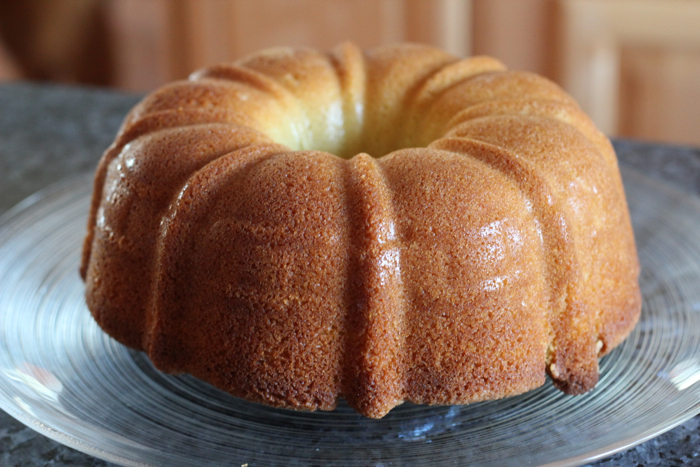 It's a lovely pound cake, rich and moist, with a not-too-rummy hint of rum. As is my wont, I left it un-iced so that we could eat it for breakfast as well as dessert. I'm sure it would be fantastic, though, with a rum sauce. I leave that up to the sweet-teeth out there. 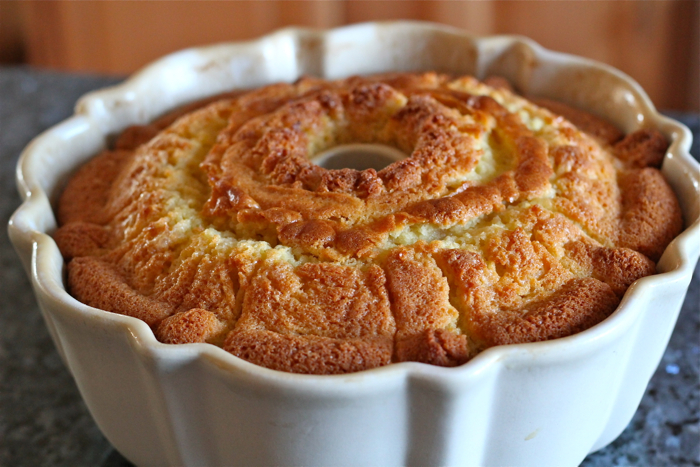 Just be happy because I was a hair's breadth away from calling this Buttermilk Dump Cake. In a medium bowl, whisk together the first four ingredients and set aside. In a stand mixer, cream together the butter and sugar. Add rum and eggs and mix well. Add the dry ingredients and the buttermilk, mixing until well combined (a few minutes). Pour the batter into a prepared 9- or 10-inch Bundt or other tube pan (preferably found AT THE DUMP). Bake for about 1 hour or until skewer inserted into the middle comes out clean. Let the cake rest in the pan for about 5 minutes before trying to remove it. Invert the cake onto a plate or wire rack and cool completely. Yum! And I'm so jealous of your pan find -- and I'm not even a cook/baker! Though I did try the mac & cheese recipe you posted last week. Sorta. I used sundried tomatoes, a bit of fresh red pepper, two of those round, sweet peppers we get from the olive bar in our grocery store, about a quarter onion (all chopped), shredded Gruyere, feta, sliced cheddar, and black pepper. I cooked the veggies, let it cool, then blended it with the cheese (except the cheddar), then mixed it with whole wheat elbows. Next, I buttered a caserole dish, then alternated layers of elbows and sliced cheddar. Poured in 1% milk to cover the elbows (top layer is cheese), then topped with Panko crumbs. Baked till golden brown. It's a combo of your recipe and my MIL's. Came out GREAT! My husband usually makes the mac & cheese with only mac, cheese, black pepper, LOTS of butter (in all the layers), black pepper, milk, and crumbs. He loved the "dressed up" version. Sara: Putting a layer of plastic wrap or foil on top would be the perfect solution, in addition to doing smaller batches. I will have to try that. And yes, join in on the CookIt! fun for April -- so far we've done pasta, bread and butter. CWM: I'm glad that something I made helped you create your own version -- inspiration is what it's all about! Thanks for sharing the details, it sounds delish! I'm going to make my own butter!! This looks so easy, and I will keep it under the speed limit! I can smell it from here...mmm...sounds fabulous!! And I have dump pan envy. For real. yummy gorgeousness despite the 'eleven fiasco'! I didn't make my own butter but the cake was so good. And so easy! Awesome, Zosia -- so glad you liked it! The kids made butter in preschool by just shaking it in a mason jar. 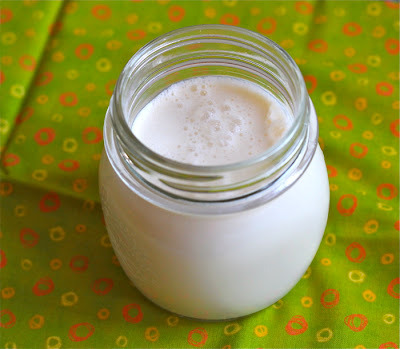 We always had a lot of extra heavy cream around after you-know-who would visit, so once we decided to try it a home and filled the jar about halfway. That was way too much, apparently, since when we got to the whipped cream stage we were out of room in the jar. Oops. 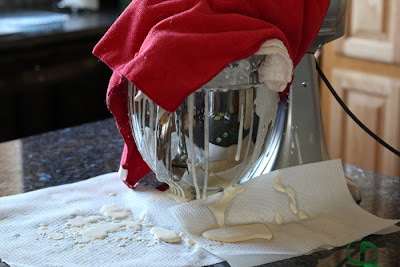 Never thought about using the mixer or food processor, though! And I love your dump pan! I wish we had a dump like that; I have to settle for picking through the neighbor's trashpile, which I never do, since it requires, you know, picking through a trash pile. I've heard about the shaking method, too, but that seemed too much like exercise. ;-) Don't forget that I got you a quilting book at the very same dump, so you're reaping the benefits, too. Well I must say I have dump pan envy too! What a treasure to find! 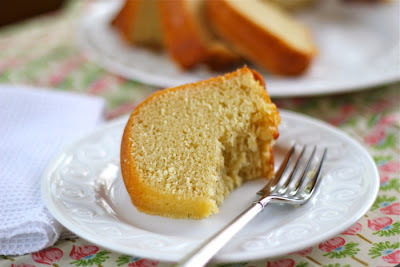 This cake looks wonderful and I am impressed that you made your own butter and buttermilk! Growing up on a farm we made our own butter and buttermilk from the cream strained off the fresh milk my brother got from the cows. My Mom put the cream in a gallon sized glass jar and we had to pass it around for hours shaking and shaking it until it made butter! I'm sure my Mom ended up doing most of the work since it was exhausting shaking that jar all night while watching TV! She had a little mixer on a stand an old one that might have worked saving us many many laborious hours! Anyway the cake looks amazing! I loved reading your step by step directions too! Thanks for sharing! Enjoy your treasure!! !